Natural disasters are increasing in frequency and severity. Since 1980, the United States has been hit by 219 weather and climate disasters that exceeded $1 billion in damages. In 2017 alone, Hurricanes Harvey, Irma and Maria, along with the California wildfires and other disasters, caused more than $306 billion in damages, eclipsing the $215 billion record of 2005. Hurricane Maria caused more than 3,000 deaths in Puerto Rico. Across the country, parks, open spaces and conservation lands help to buffer communities from some of the damages caused by these natural disasters. Riverfront trail systems can capture and store water during floods, areas managed for vegetation can serve as wildfire buffers, coastal wetlands can reduce coastal storm damage and urban trees can reduce the impacts of dangerous heatwaves. Economic studies have shown that these “nature-based solutions” can be more cost-effective than traditional man-made solutions, like levees or seawalls, while providing multiple community benefits. Put simply, parks and open spaces are an important component of resilience planning. Most of the budget for the Federal Emergency Management Agency (FEMA) is allocated to disaster response. However, FEMA also spends billions of dollars on “hazard mitigation,” assistance to communities to reduce or eliminate long-term risk to people and property from natural disasters. For example, following a presidentially declared disaster, such as Hurricane Harvey in 2017, FEMA’s Hazard Mitigation Grant Program (HMGP) was made available to help communities in affected areas implement hazard-mitigation measures, such as targeted buyouts, structure elevation, flood-risk-reduction projects, and long-term planning. Increasingly, FEMA has begun to recognize the role of nature-based solutions for building community resilience and mitigating the impacts of floods, wildfires and drought. These advances are reflected in recent policy updates that recognize the economic value of these kinds of investments and have made it easier to access FEMA mitigation funding for land conservation (especially in floodplains) and other nature-based solutions, such as post-wildfire restoration of forested lands, aquifer storage and recovery, wetland and riparian restoration, and green infrastructure. Furthermore, cities, park agencies and private nonprofit land trusts are eligible to apply for these funds. FEMA is also placing greater emphasis on proactive investments before disasters occur, underscored by the 2018 Disaster Recovery Reform Act (DRRA), which passed in Congress with overwhelming bipartisan support. The DRRA significantly increased the amount of funding for “Pre-Disaster Mitigation” (PDM), another important mitigation program under FEMA. The new PDM Program will likely result in the availability of hundreds of millions of dollars (perhaps even a billion dollars) for hazard mitigation projects each year. The PDM Program is an annual, nationally competitive program that is not tied to any specific disaster, like HMGP. The grant application process is expected to open in late 2019. A project in Houston that identified several large parcels of open space in the floodplain along a bayou that could be acquired and restored for the purposes of flood-risk reduction. Traditionally, FEMA has done buyouts of properties with homes that flood frequently but not of open space. Our economic analysis showed that by acquiring and restoring these parcels to native tallgrass prairie, the land itself would hold a lot more water during flood events, reducing damage to downstream structures — effectively making it part of the flood storage infrastructure for Houston. And, when the land is not flooding, it can be used for recreation along the river. A project in California proposed acquisition of a large parcel of land next to an urban area that burned hot and fast during the 2017 fires because of the presence of many invasive grasses and caused nearly 400 homes to burn. The homes are already being rebuilt, but the area is still considered to have very high fire risk. Our partner proposed acquiring the parcel, restoring it to native oak woodland (which burns cooler and more slowly), creating defensible space next to the homes, and removing hazardous fuels. The land would also be opened to recreation, in an area with relatively few hiking trails. For cities, agencies or land trusts interested in pursuing or learning more about FEMA’s Hazard Mitigation funding opportunities, the first stop is their state Emergency Management agencies — for example the California Office of Emergency Services or Texas Department of Emergency Management. These agencies process FEMA applications, establish state priorities, and provide support and training for local FEMA applicants. Earth Economics is also available to discuss project ideas or questions. 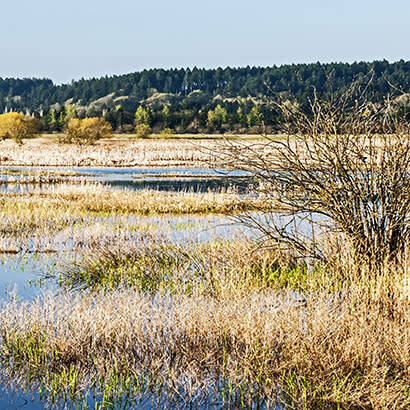 Resilience is an important priority for state and local governments, and there is a growing recognition that ecosystem restoration and conservation can play a crucial role in cost-effective hazard mitigation. FEMA’s recent policy changes open the door for more cities, park agencies and land trusts to create parks and open spaces that not only create recreational spaces and natural areas, but also build long-term community resilience. Rowan Schmidt is the Program Director for Earth Economics, Johnny Mojica is a Research Lead for Earth Economics and Jordan Wildish is a Research Analyst for Earth Economics.